Here at Canine Hoopers UK we know that a lot of people want to have fun with their dogs and whilst for some people that means competing, for others it means spending time together, learning, bonding and doing fun things. 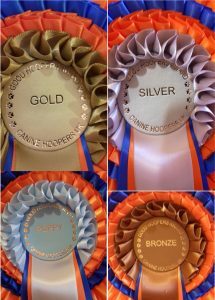 Canine Hoopers UK is proud to offer our awards scheme with achievable fun goals at 4 different levels for you to work towards! The four different levels are Puppy, Bronze, Silver and Gold. To find out more about each one and what is involved then simply click on the level! Young dogs from 6 months old are able to participate with the Puppy level being based on building a solid foundation for their future hoopers training. 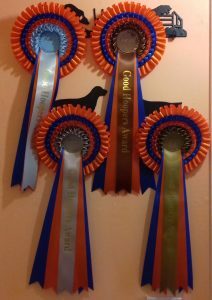 The Good Hoopers Award Scheme is offered by all Accredited Canine Hoopers UK Instructors and their training clubs, upon successful completion of each assessment you will be awarded with a lovely certificate to mark your achievement and a beautiful 4 tier rosette to display proudly!